Strabismus - A misalignment of the two eyes, affecting about 4% of children. Strabismus is usually described by the direction of misalignment, which can be outward (exotropia), inward (esotropia), upward (hypertropia) or downward (hypotropia). A child may also have a phoria with eye deviation only when one of the eyes is covered or when he is tired or sick. Amblyopia - Reduced vision in an eye, which can be secondary to strabismus, anisometropia (unequal refractive errors in both eyes, for example, if one eye is more farsighted than the other eye), congenital cataracts, etc. Refractive errors - Such as myopia (nearsightedness) and hypermetropia (farsightedness). In younger children, a vision evaluation will usually consist of an examination for the red reflex (checks for cataracts and retinoblastoma), eye alignment (misaligned eyes may indicate strabismus) and eye movements. Older children, beginning at three years of age, should have a more formal test of their vision. Until formal vision testing is possible after three years of age, younger children's vision can be assessed by observation of how they fixate and track objects and by the history of the child's parents. Visual milestones for infants include being able to follow an object to midline in the first 2-6 weeks, past midline by 1-3 months and follow an object 180 degrees by 3-5 months. If your child isn't meeting these developmental milestones on time, then you should see your pediatrician for an evaluation. Other testing may include the corneal light reflex test, in which a light is directed at the bridge of the nose and the light reflex is examined to make sure it is symmetrical or shines in the same spot on both eyes. If the light reflex is off-center or not symmetrical in both eyes, then it might indicate a misalignment of the eyes. This is useful to differentiate pseudostrabismus, a condition in which the eyes appear to be misaligned because of prominent epicanthal folds or a broad nasal bridge and which doesn't require treatment, from true strabismus. The unilateral cover test can be used to determine if an infant or young child will follow an object while one of the eyes is covered. For example, your pediatrician can see if your child can fix on and follow a toy with both eyes, and then cover the left eye and see if he continues to follow it with his right eye. Then, the right eye is covered to see if he will follow the toy with his left eye. If he gets really fussy or refuses to follow the object when you cover one of his eyes, then that may indicate that the vision in the other eye is reduced. In older children, the unilateral cover test is also useful to check for strabismus. While the child is looking at a distant object, such as an eye chart or toy, cover one of his eyes. If the other eye moves out or in, then that might indicate that his eyes are misaligned and that he has strabismus. The test is then repeated by covering the other eye. Other problems that indicate the need for further evaluation include parents noticing that their child's eyes are crossing, that their eyes aren't straight or if they just don't seem to be seeing well. It is important to keep in mind that younger children usually don't report problems with their vision, especially if the problem is in just one eye and the other eye is accommodating for it. Older, school age children, may report that they can't see the board, or they may have frequent headaches, double vision, or are frequently squinting. Formal testing of visual acuity is usually possible once a child is three years old, although 2-year-olds may be able to be tested with picture cards. The Allen chart includes easily recognized pictures, including a cake, hand, bird, horse, and telephone. Another test that is commonly used for 3-5-year-olds is the tumbling E chart or 'E' game, a chart with the letter E in different orientations (up, down, right and left) and sizes. Children are tested by asking what orientation or direction the letter E is in at each letter size. To prepare your child for this test, you can play the pointing game from Prevent Blindness America. They also have a copy of the Distance Vision Test for Younger Children, which uses the E chart, and which you can use at home. For children who can recognize some letters, the HOTV system, in which the letters H, O, T and V are displayed in different sizes on a chart can be used. The child is given a board with a large H, O, T and V on it, and he is instructed to point to the letter on the board that matches the letter on the chart. Older children can be tested with the regular Snellen eye chart that is used for adults. In general, the Snellen chart is the most accurate and should be used when possible. In addition to their visual acuity, how a child's two eyes compare to each other is also important. At any age, if there is a two line difference between the eyes, then that might indicate a serious loss of vision, like for example, if one eye is 20/20, but the other eye is 20/40. Or if one eye is 20/30 and the other eye is 20/50. Children who are uncooperative or who fail a vision screening test in the Peditrician's office, especially if it is on multiple attempts, should be seen by a Pediatric Ophthalmologist for more formal testing. A referral to a Pediatric Ophthalmologist is also a good idea for children with strabismus after they are six months of age, if they have ptosis, where the upper eyelid droops, or if either eye is fixed in place or has limited movement, although it is usually normal if a newborn or young infant's eyes occasionally cross. Strabismus is another Pediatric condition in which a 'wait and see' approach to find out if a child will grow out of the problem is not appropriate. Children should also be seen by an ophthalmologist if they are at high risk of having visual problems, such as premature infants, children with Down syndrome, Sturge Weber syndrome, JRA, neurofibromotosis, diabetes or Marfan syndrome, children born with a congenital infection, or if there is a family history of strabismus or other childhood eye disorders. 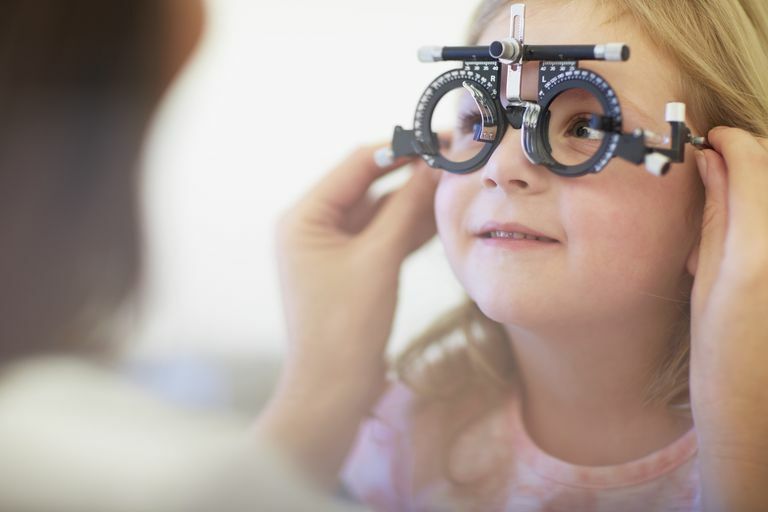 Also, if your pediatrician doesn't offer vision screening at the 3-year-old checkup, you might consider seeing a pediatric ophthalmologist to have your child's vision checked. An Ophthalmologist is a medical doctor (MD), whose training includes 4 years of college, 4 years of medical school, 1 year of internship and 3 years of residency training in ophthalmology. In addition to prescribing glasses or contact lenses, ophthalmologists diagnose and treat most eye disorders and perform eye surgery. A Pediatric Ophthalmologist (MD), in addition to completing medical school, an internship and ophthalmology residency, has completed an extra year of fellowship training in pediatric ophthalmology. An Optometrist (OD) has usually completed 2-4 years of college and 4 years of optometric college. An optometrist can diagnose and screen for vision abnormalities and prescribe glasses and contact lenses. Sight for Students - This program provides vision exams and glasses to uninsured children in the United States.